Last spring, after I got my little garden set up behind the house, I noticed we got lots of little buggies and fat crawly critters running around and eating my leaves. Since the pugs roam around back there, I didn't want to use anything chemically or potentially hazardous to pugs. One of my friends (she call's herself my red-neck friend) says "country folk" crush up eggshells and sprinkle them on the base of their plants. Bugs crawl on them and injure themselves on the sharp edges and keep away!! 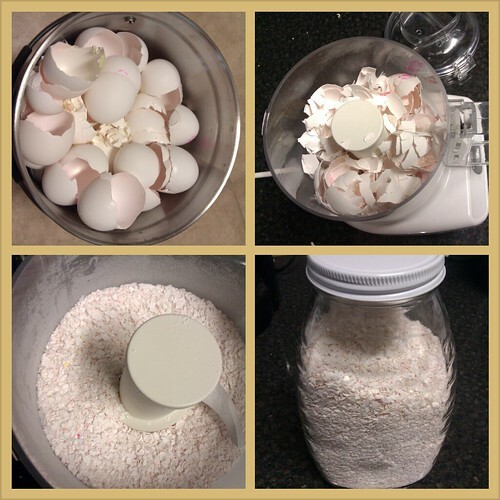 I tried it for a little bit, and it seemed to work so now, I collect our eggshells and make my own anti-bug sprinkles. Egg shells are also good to put in the bottom of newly planted veggie plants because they help by slowly breaking down and adding calcium. There's lots of other uses for egg shells besides just tossing them in the compost bin. I do recommend using a small food processor you won't mind if the container goes cloudy - eggshells will scratch plastic. And a take-away from high school chemistry class: use the stove area fan/vent when opening or pouring out the crushed bits. Eggshell powder is not yummy in the eyes or nose. If you have any other DIY-type garden tips, let me know!! I cannot wrap my head around a bug cutting his leg on an eggshell. Fascinating! I know right?! My friend Faith said it'll cut their legs right off and slice up their bellies. I actually found this on a gardeningknowhow.com just now, "Eggshells can also be used in the garden to help fight off pests like slugs, snails, cutworms and other crawling pests. Crushed eggshells works much like diatomaceous earth on these pests. When crawling pests cross over an area in the garden where crushed eggshells have been spread, the eggshells make several small cuts in the pests. The pests then dehydrate and die due to these cuts."